Exhibitors tell how they are increasing their trade show participation, why they value trade shows, and how they are exhibiting better at trade shows than before. Attendees share the high value they place on trade shows for sourcing products, comparing and meeting suppliers, and keeping up on industry trends. Attendees also reveal what exhibitors can do most that will catch their attention. An extremely high 91% of exhibitors say that conventions, trade shows and conferences will remain to be critical to marketing over the next five years. A significant 88% of attendees say that conventions, trade shows and conferences are an important part of their product sourcing and buying process. An even higher percentage (91%) agrees that conventions, trade shows and conferences are essential for comparing products and meeting suppliers. 90% of attendees feel that business events will continue to be critical to their product sourcing and purchasing over the next five years. Travel and event attendance budgets are expected to increase by an average of 4.1% this year. 57% of attendees say they or their organization make a major purchase, or finalize an important deal, within three months of attending an event. This white paper provides exhibit marketers with a blueprint for justifying -- and enhancing -- the value trade shows have in their company’s marketing plan. 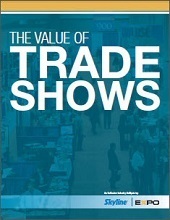 Exhibitors also share in this report how they are marketing at and selecting trade shows differently, and what are the most common methods exhibitors have used to improve their trade show programs over the last two years.